For many 13 may be considered an unlucky number, but when it comes to seeing 13 cheetah in a single day at Chitabe camp I consider it not only a good thing, but also a privilege. It ceratinly stands as a record for me that will remain unbroken for many years to come. This time of year, the rains have come and filled the shallow floodplains with water, leaving the entire area blanketed with fields of wavering tall grasses. The 5 cubs on the right found it easier to walk on the tracks and, immediately on seeing me, they turned and ran straight towards my vehicle. It certainly came very unexpected! The very same afternoon, 2 bateleur eagles perched in a tree drew our attention. As we were sitting and watching, another bateleur landed which prompted us to scan around with a little more intent. A flash of white and a liitle movement alerted us to the fact that a female cheetah had killed an impala and dragged it deep into the cover of bush. Patiently sitting and waiting finally drew the 6 young cubs out, allowing me to shoot just a few frames with all 6 cubs in it. 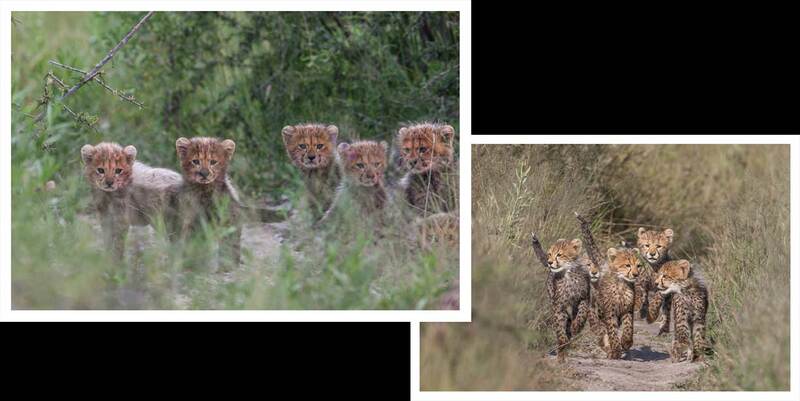 The image on the left has the 6th cub partially hidden below on the right side of the frame.